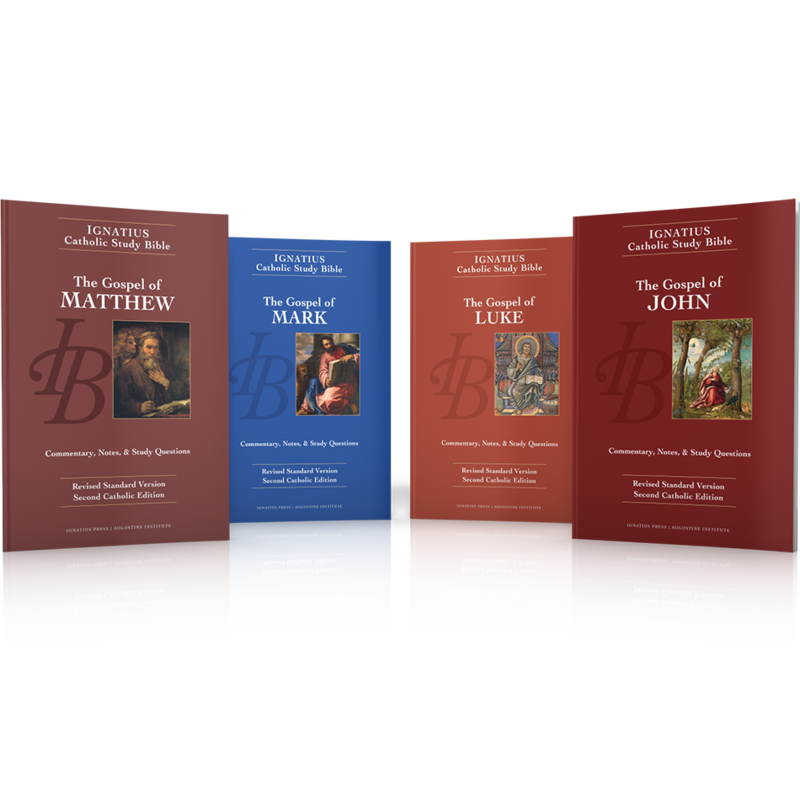 Individual Gospels are available for $9.95 per copy, but now get all 4 Gospels for only $34.95! Based on the Revised Standard Version – Catholic Edition, these 4 books lead readers through a penetrating study of the each of the four Gospels, using the biblical text itself and the Church's own guidelines for understanding the Bible. Ample notes accompany each page, providing fresh insights and commentary by renowned Bible teachers Scott Hahn and Curtis Mitch, as well as time-tested interpretations from the Fathers of the Church. These helpful study notes make explicit what the four Evangelists often assume. They also provide rich historical, cultural, geographical and theological information pertinent to the Gospels. The Ignatius Study Bible also includes Topical Essays, Word Studies and Charts. Each page also includes an easy-to-use Cross-Reference Section. Study Questions are provided for each chapter of the Gospels that can deepen your personal study of God's Holy Word. There is also an introductory essay covering questions of authorship, date, destination, structure and themes. An Outline of each Gospel and several maps are also included. 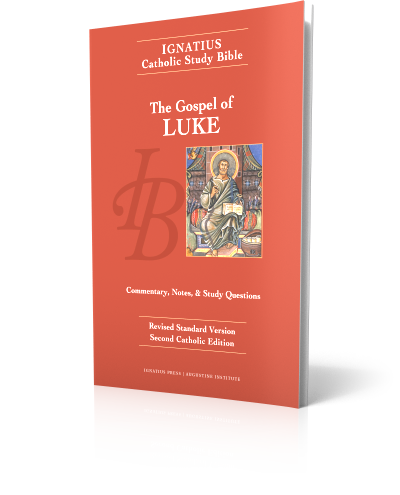 Based on the Revised Standard Version – Catholic Edition, this book leads readers through a penetrating study of the Gospel of Luke, using the biblical text itself and the Church's own guidelines for understanding the Bible. Ample notes accompany each page, providing fresh insights and commentary by renowned Bible teachers Scott Hahn and Curtis Mitch, as well as time-tested interpretations from the Fathers of the Church. These helpful study notes make explicit what St. Luke often assumes. They also provide rich historical, cultural, geographical and theological information pertinent to the Gospel. The Ignatius Study Bible also includes Topical Essays, Word Studies and Charts. Each page also includes an easy-to-use Cross-Reference Section. Study Questions are provided for each chapter of the Gospel that can deepen your personal study of God's Holy Word. There is also an introductory essay covering questions of authorship, date, destination, structure and themes. An Outline of Luke's Gospel and several maps are also included. 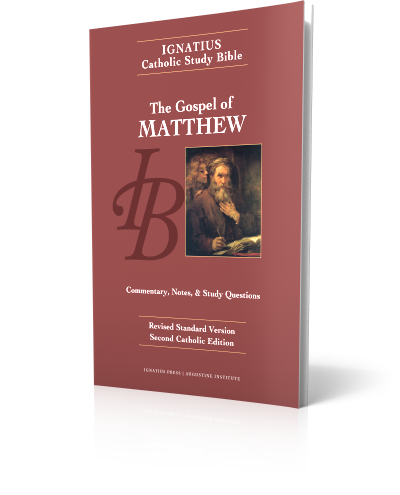 Based on the Revised Standard Version – Catholic Edition, this book leads readers through a penetrating study of the Gospel of Matthew, using the biblical text itself and the Church's own guidelines for understanding the Bible. Ample notes accompany each page, providing fresh insights and commentary by renowned Bible teachers Scott Hahn and Curtis Mitch, as well as time-tested interpretations from the Fathers of the Church. These helpful study notes make explicit what St. Matthew often assumes. They also provide rich historical, cultural, geographical and theological information pertinent to the Gospel. The Ignatius Study Bible also includes Topical Essays, Word Studies and Charts. Each page also includes an easy-to-use Cross-Reference Section. Study Questions are provided for each chapter of the Gospel that can deepen your personal study of God's Holy Word. There is also an introductory essay covering questions of authorship, date, destination, structure and themes. An Outline of Matthew's Gospel and several maps are also included. Based on the Revised Standard Version – Catholic Edition, this book leads readers through a penetrating study of the Gospel of Mark, using the biblical text itself and the Church's own guidelines for understanding the Bible. Ample notes accompany each page, providing fresh insights and commentary by renowned Bible teachers Scott Hahn and Curtis Mitch, as well as time-tested interpretations from the Fathers of the Church. These helpful study notes make explicit what St. Mark often assumes. They also provide rich historical, cultural, geographical and theological information pertinent to the Gospel. The Ignatius Study Bible also includes Topical Essays, Word Studies and Charts. Each page also includes an easy-to-use Cross-Reference Section. Study Questions are provided for each chapter of the Gospel that can deepen your personal study of God's Holy Word. There is also an introductory essay covering questions of authorship, date, destination, structure and themes. An Outline of Mark's Gospel and several maps are also included. 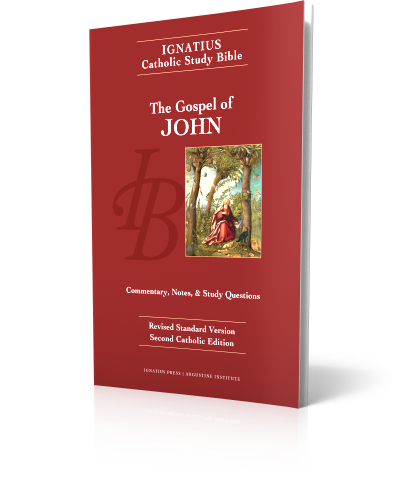 Based on the Revised Standard Version – Catholic Edition, this book leads readers through a penetrating study of the Gospel of John, using the biblical text itself and the Church's own guidelines for understanding the Bible. Ample notes accompany each page, providing fresh insights and commentary by renowned Bible teachers Scott Hahn and Curtis Mitch, as well as time-tested interpretations from the Fathers of the Church. These helpful study notes make explicit what St. John often assumes. They also provide rich historical, cultural, geographical and theological information pertinent to the Gospel. The Ignatius Study Bible also includes Topical Essays, Word Studies and Charts. Each page also includes an easy-to-use Cross-Reference Section. Study Questions are provided for each chapter of the Gospel that can deepen your personal study of God's Holy Word. There is also an introductory essay covering questions of authorship, date, destination, structure and themes. An Outline of John's Gospel and several maps are also included.